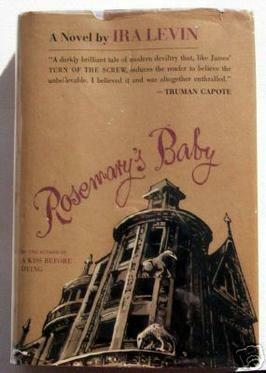 Rosemary’s Baby – life of di. Prior to reading this novel, I truthfully had no knowledge of the plot line. I was aware that Mia Farrow starred in Roman Polanski’s screen adaption; however, that was the height of my familiarity. After finishing the 254 page story in 3 days, I must say … I couldn’t put it down. I loved this story because, as a reader, you’re continually surprised. With each flip of a page, Levin exceeds your expectations – pushing the limits with the progressive writing. There are hints of suspicion throughout the novel; however, you truly are discovering everything at the same pace as Rosemary. I love this. I love when an author lures the reader deep into a story; you feel as if you’re – not in front of or behind – but walking side by side the main character. The character development was another aspect I want to praise. Levin is all about details. Details. Details. From the creepy neighbors, Mr. and Mrs. Castavettes, to Rosemary’s dear friend, Hutch – you really get to know these characters (which enhances the realism of the story). I understand that some may perceive me as hypocritical for enjoying a book that could ultimately be interpreted as abusive to women; however, in my opinion, the book stands to be one of my favorite horror stories and is clearly underrated. I must say that I was a bit apprehensive when starting this 1967 novel. In the updated version, Ira Levin included an authors’ note detailing why he chose to write Rosemary’s Baby. He mentioned, “I am not a believer. In witchcraft or any religion” and “I studied witchcraft to leave no end untied”. I almost wish I hadn’t read this because I felt guilty throughout the entire novel. I recognize the difference between fantasy and reality; nonetheless, witchcraft is a satanic practice that is very real. I don’t support, nor do I want to involve myself in this following; however, reading Rosemary’s Babywas purely for simple amusement.